Three German friends set out to recreate one of the most impressive cars ever made - Mercedes 300 SLR ‘Uhlenhaut Coupe’ – out of pieces of scrap metal. It’s not drivable, but their replica is definitely easy on the eyes. Armin Ciesielski, Peter Brakel and Walter Willer, three friends working at a German company called Giganten aus Stahl (Giants of Steel), decided to pay homage to one of the greatest cars ever made, by making a life-size model out of metal. The three sculptors sourced thousands of pieces of metal for their recycled masterpiece anhttp://www.blogger.com/img/blank.gifd spent seven months cutting and putting it together. Although Ciesielski claims he could rebuild any car out of crap metal, he admits this particular project was a rather difficult one because of all the intricate details and the work that went into making even the car’s engine identical to the original. Mercedes 300 SLR ‘Uhlenhaut Coupe’ had a top speed of 180 mph, and would have been the fastest car in the world if launched in 1955, Unfortunately, Mercedes decided it was too fast for the general public, and only two prototypes of the iconic supercar are still around today, both of which are at the Mercedes Museum, in Germany. 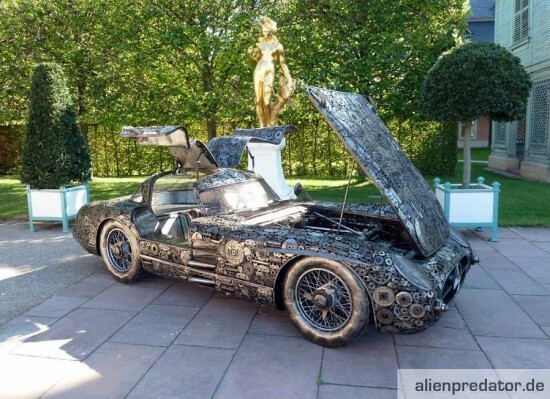 Although this 10,000 scrap metal piece replica can’t be driven, its creators are hoping fans of the original will still take it off their hands for $100,000.